Prior to HP putting the TouchPad and webOS on the chopping block, a 7” model had made its way to the FCC and a launch was supposedly forthcoming. However, after the discontinuation, the 7” tablet (codenamed the HP “Opal”) disappeared and was never heard of again…until now. According to claims by a poster on Chinese forum ZooPDA.com, a prototype of the 7” TouchPad has been in his possession for the past 3 months. 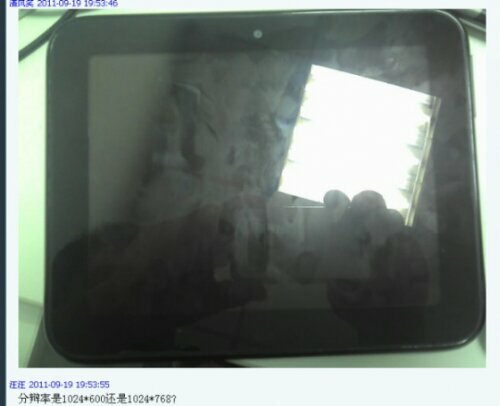 The post is accompanied by snapshots of the device, and a smaller TouchPad-resembling tablet is clearly seen along with a SIM slot for possible 3G/4G and what appears to be a removable battery. Furthermore, it looks like HP outfitted the device with a 1.5GHz Snapdragon dual-core chip, front and rear facing cameras, an NFC module, and a 1024x768 pixel resolution that matches the 9.7” TouchPad. The aforementioned specs definitely corroborate what we’d previously heard about the TouchPad Opal, and we see little reason to doubt the poster’s claims. Interestingly, the 7” device beats its larger sibling with a higher PPI (pixels per inch), a more powerful processor and 3G/4G capabilities, yet HP never even officially announced the device. In addition, the removable battery would have made it the 2nd tablet with such a feature (the first being Toshiba’s Thrive), but sadly we’ll never know how the device would have fared had it hit the open market. For more images of the prototype, check out the source links below.